You can spend the next six weeks optimizing your Facebook Ad: testing the CTA, tweaking the ad audience, changing the image from purple to green to orange to taupe, etc, etc, etc. But the fact of the matter is this: While all of this effort might double your Facebook Ad clickthrough rate, it's useless unless the page you're sending people to is optimized to receive them. It'd be like telling a prospective customer to head over to your brick-and-mortar store when it's closed. So, when we're talking about making your Facebook Ad campaigns profitable, we need to first talk about testing (see the Chapter on that), and once we've done as much as we can on the platform itself, we need to talk about landing pages. If your Facebook Ad is directing people to your website the most critical element of that campaign is the landing page, not the Facebook Ad itself. Think about it… what does it matter if your ad is sending 1000 people a day to your website, if none of them are becoming leads or customers? Not only are you wasting ad budget, but you're wasting time. Matching design elements and images: There needs to be consistency between your ad and your landing page, as a jarring discontinuity throws off prospective customers and makes them feel like they're in the wrong place. 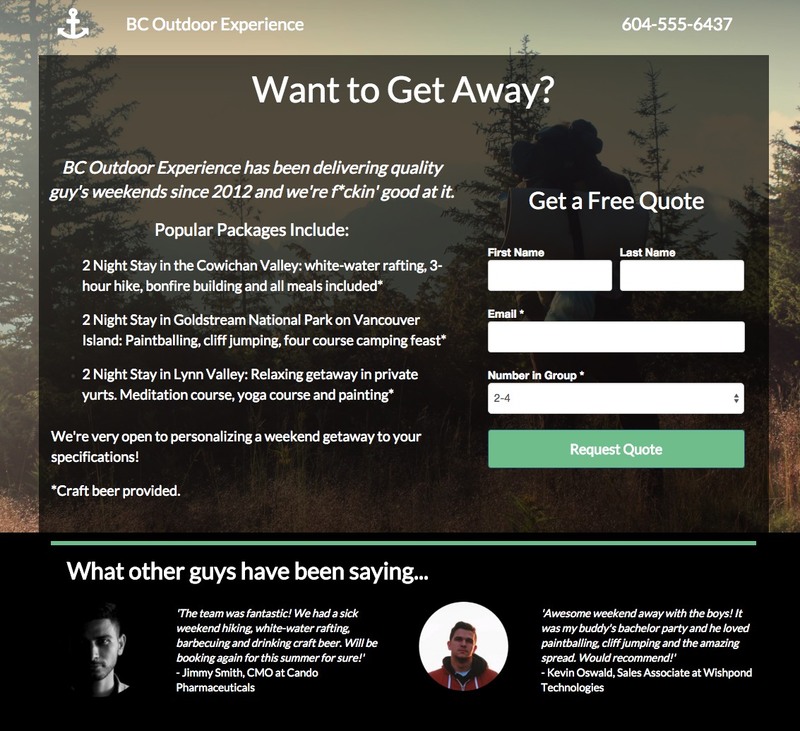 A clear and highly-visible call-to-action: Your landing page visitors need to know how they can act on their interest in your promotion. Don't hide that action in a text link. 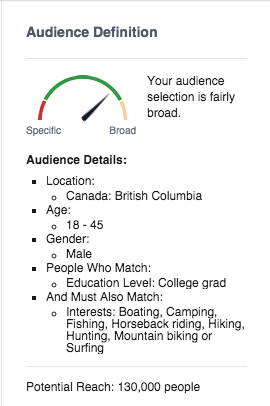 Clear messaging which matches and expands on the Facebook Ad: Your Facebook Ad has directed users based on you selling them with value and an appealing message. Make sure that appeal doesn't fizzle with an aimless page. To give you an example, here's a Facebook Ad audience next to a landing page optimized for it. The target audience for this Facebook Ad is males between 18 and 45. As the product (a company offering "Guy's Weekend" getaway packages) is a high-priced one, I've also targeted college graduates. This is an example of the limitation of Facebook Ads, as (though they used to have the capability) we can no longer target by income. We've also targeted based on Interest in the outdoors. This gives us a target audience of about 130,000. If we give ourselves a $20 daily budget, we should see roughly 6,000 daily impressions, resulting in 40 or so qualified prospective customers clicking through to our landing page each day. Copy: Young, college-graduate men between 18 and 45 respond to different tones and language than, say, women 45-65. Therefore, we need to write for that audience, and this landing page does that: "We're f*ckin good at it" and "craft beer included" appeals to that audience and will improve conversion rates. I'd also recommend that the Facebook Ad design should reflect this language awareness as well. Testimonials: I mentioned above that any testimonial within your landing page needs to be given by someone similar to the people visiting that page. In this case we have a CMO and a sales associate of a similar age to our target audience. Essentially, reviews like this make the landing page visitor think "If guys like me had a good time, I will as well." Image: The image, like the testimonials, shows someone of a the same gender and age as the target market engaging in something which looks inspirational. Images like this are great at creating an emotional reaction to the landing page. I'd definitely test a different color scheme (perhaps red as an accent color). I'd also test messing around with the language - either going full casual or full professional (as it's currently somewhere in the middle). For more on the psychology of landing page conversion check out The Ultimate Guide to the Psychology of Conversion Optimization. For more on landing page optimization, check out 5 Landing Page Conversion Killers or 17 Landing Page Examples Reviewed.